Gunnar is widely recognized for his expertise in functional training and his commitment to developing and implementing innovative fitness techniques. As an extension of his brand, Gunnar has created a full service gym design company that combines his training philosophy, tradition, and technology, into high end luxury home and commercial gym spaces. 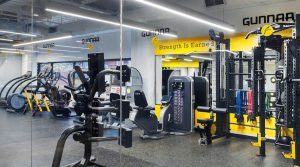 Gunnar Gym Design was created to redefine the home gym experience and provide clients with bespoke designs, state of the art equipment, as well as the same customized functional accessories that can be found in at Gunnar’s private gym in Beverly Hills. Every custom gym is designed according to our clients’ individual needs. Our team can collaborate with your architect, builder or designer to incorporate their vision into the gym space with the assistance of our 2D and 3D CAD systems. We use certified technicians for our installations to ensure that the clients receive as much help and instruction as needed.